Does fried avocado sound like a good idea to you? It didn’t to me either. But at the Hudson Room, a happening new space in the heart of Peekskill, it somehow worked. 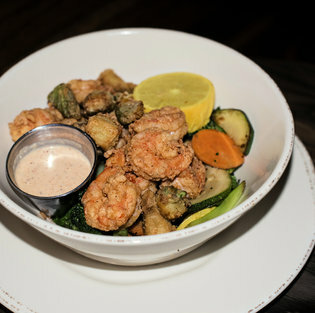 Part of a “shrimp and avocado fry” that included expertly fried Gulf shrimp and chunks of avocado with a side of spicy mustard rémoulade, vegetables and brown rice, the bowl captured the feel of the restaurant: Funky meets sophisticated. The eclectic menu is reflected in the space itself. A former five-and-dime storefront, the Hudson Room is cavernous but manages to seem intimate by creating distinct areas. There is a full bar with backlit shelving to the left of the entrance and a sushi bar to the right. A large stage toward the rear brings music and other acts to the restaurant, and the seating ranges from a group of large rounded leather banquettes facing the stage to smaller tables along the big windows in the front. It looks like fun from the outside, and it is. Much of the food has a welcome spicy kick. 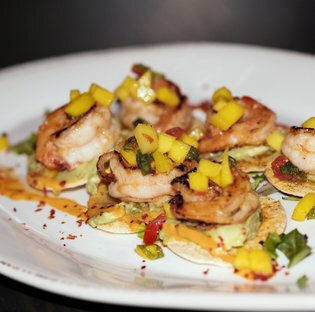 Sriracha sauce is featured in the spicy tuna roll and on the seared shrimp with guacamole on crisp little flour tortillas. A special of grilled lamb rack came with a hot mustard/garlic/chipotle crust (and excellent Cheddar mashed potatoes). And the “pink” clam chowder had a peppery taste that brought out the flavors of the soup’s smoky bacon pieces, corn and fennel. That appetizer is made with mostly local ingredients, including cream, courtesy of Lanza Farms in Garrison, which is owned by Louis Lanza, one of the Hudson Room’s four owners. When there isn’t heat, the dishes can be less interesting. Rigatoni with meatballs in a red sauce was a bit bland. Orecchiette came with tender pieces of chicken and pork sausage but the sweet cherry peppers could have used more spice and, combined with lemon zest, became a mishmash of tastes. “Loaded fries” — French fries covered with asiago, Parmesan, scallions and truffle oil — sounded intriguing but were mushy, collapsed by overambition. Indeed, some of my favorite items were the simplest. The Hudson roll — Gulf lump crab, cucumber and avocado with a dusting of masago — had a wonderfully clean, sweet flavor. The seared Scottish salmon with a ginger-scallion butter had a great crust, moist meat and a rich taste. The Hudson Room’s mantra is “globally inspired, locally sourced.” There are lots of influences at work — Cajun, Italian, Japanese and more — but also a lovely local feel. Most of the desserts, for example, are made daily by Peekskill’s beloved old-school bakery, Homestyle. (If the mascarpone layer cake is on the menu, it is definitely worth a try, as is the kitchen’s own creamy cheesecake and delicious ice cream.) The bar offers beer from a Japanese craft brewery, a Barolo made with grapes grown in California and an Australian wine made with grapes from Germany and France. It is all a reflection of the ways the culinary world has expanded and gotten more intimate at the same time, so that people are familiar with tastes from around the globe but use them to create something of their own. The owners behind the Hudson Room (in addition to Mr. Lanza, who is also the chef, they are Daniel Steinberger, Cheng Ling and Jose Quinoy) have years of experience with Manhattan restaurants and wanted to bring some of that sophistication to Peekskill’s growing restaurant scene. They have bought four other buildings in the Hudson River town and plan to open a taco and tequila bar, a barbecue place and more. The Hudson Room, which opened in August, is certainly offering new culinary possibilities, and that is a welcome development. THE SPACE A former five-and-dime storefront in the heart of Peekskill, the dining room is a cavernous space with industrial piping, large windows in front and distinct areas: a sushi bar, a stage toward the back, a liquor bar to one side and dining tables throughout. Wheelchair accessible. THE CROWD Drawn from throughout the Hudson Valley. The restaurant has a sophisticated feel and a bit of a bar scene but children are welcome and there is a short menu for them. THE BAR A comfortable space of its own to one side of the front of the restaurant. The usual full offerings with some surprises, including beer from a Japanese craft brewery and a Barolo grown in California. The wine list is adequate and still being worked on ($8 to $10 a glass, $30 to $100 a bottle). THE BILL Sushi rolls from $8 to $22; entrees from $17 to $25; specials can run higher. Major credit cards accepted. WHAT WE LIKED Spicy tuna roll, Hudson roll; crispy calamari salad, “pink” clam chowder, sriracha shrimp; shrimp and avocado fry, seared salmon, grilled lamb rack (special); cheesecake, mascarpone cake, ice cream. IF YOU GO Open Mondays to Thursdays, 5:30 p.m. to 10 p.m.; Fridays and Saturdays, 5 p.m. to 11 p.m.; Sundays, 4 p.m. to 9 p.m. (Bar open two hours after kitchen closing time.) Reservations recommended on weekends and live performance nights. Parking on street or in city lot just down the block behind the restaurant.